AMOLF researchers have developed nanoscale strings whose motion can be converted to light signals with unprecedented strength. 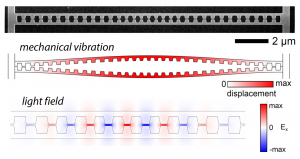 This could allow for extremely precise sensors and comes with an important side-effect. “Analogous to a guitar amplifier in overdrive producing distorted sound waves, our strong motion-to-light conversion leads to distorted light signals”, says group leader Ewold Verhagen. “But these signals actually carry information about the motion that may lead to new ways of measuring quantum mechanical motion.” The researchers published their results on 7 July 2017 in Nature Communications. When a guitar player turns up the volume of the amplifier to the highest gain levels, the ‘clean’ harmonic vibrations of the guitar strings are converted to distorted sound waves. This ‘dirty’ sound is often highly desired: the screaming of overdriven guitar amplifiers has defined the sound of rock music for decades. 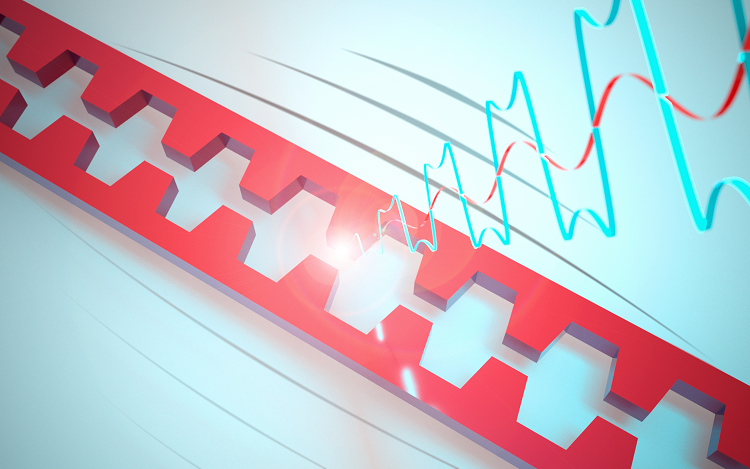 Artist impression: Tiny vibrations of nanoscale strings are converted to light signals. Whereas this usually produces a ‘clean’ modulation (shown in red), the extremely strong interaction between motion and light produces light signals that are distorted like the sound of an overdriven rock guitar (shown in blue). (top) Electron microscope image of the silicon nanostrings in the shape of a sliced photonic crystal. Their vibration (middle, motion exaggerated) strongly affects light that is trapped between the ‘teeth’ of the strings (bottom).